My mum was recently diagnosed with cancer, and at first, I didn’t plan on telling my kids about it. It seemed like too much of a burden to share with them; I wanted to protect them and keep the illness behind the scenes. Besides, the whole thing was such a shock to deal with that I didn’t think I could face telling them. But that thinking didn’t last long. I mean, kids aren’t clueless, right? It was only a matter of time before they twigged something wasn’t right, and I couldn’t keep explaining mum’s hospital visits for tests and consults with little white lies. I knew I had to tell them, but where to begin? And how much was I meant to say? With the dreaded c-word affecting so many families, I knew I wasn’t the only one to be wondering how to communicate about this with my children. I decided to do some research to find out the best ways to get started. Although it might be tempting to keep something like cancer hidden away, kids are going to realise something isn’t okay before too long, and this could leave them feeling unsettled and anxious, with no one to talk to. The reality is that children are going to notice something isn’t right, whether it’s by seeing you upset, hearing serious conversations in hushed tones, or wondering why a relative isn’t around like they used to be. This lack of understanding and communication can cause uncertainty and fear in children, especially if it includes a change in their usual routine. “Children are so reliant on routine that when it’s disrupted – for example, someone else starts taking them to school – they need to know why and what’s going on,” agrees Dr Martin. A lot of children may already have heard of cancer, so ask them what they know before you begin the conversation – you might be surprised. Depending on the age of your children, they’re likely to have a variety of questions for you. Young children may seem concerned about themselves because this is how their world is to them – at their developmental stage, the world revolves around them and they don’t see the bigger picture. Questions like ‘Is it because of me?’ or ‘But what will happen to me?’ are quite normal to hear. If you’re worried about fielding questions you don’t really know how to answer, you can look into using the Camp Quality Kids’ Guide to Cancer App, a free, interactive program that supports kids with a parent or family member who has cancer. Be honest about what your children should expect when it comes to cancer treatment, so they can be prepared for their loved one to look and feel different as they progress through treatment. Also, be sure to explain that it’s the treatment causing the side effects they might notice, such as hair loss, fatigue and nausea – not cancer itself. Because your children will follow your lead, it’s important to make sure you’re okay in all of this too, says Dr Martin. While it’s okay to be sad in front of your kids, it’s not ideal to break down and be an emotional wreck in front of them, and you can hardly support the wellbeing of your kids if you’re not coping yourself. 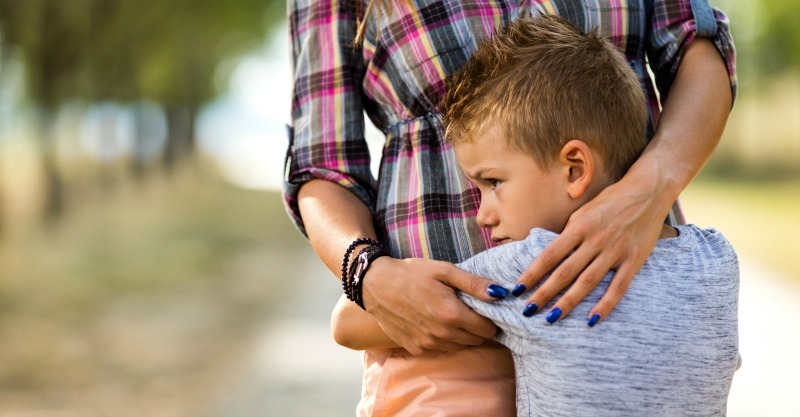 While your family is dealing with this huge situation, it’s important to stay connected and ensure your children feel close to you. Do your best to keep some family time sacred, such as a regular family meal or just snuggling on the couch with your children. “Let them know they can talk about cancer with you at any time, so you’re offering a listening ear about the topic. Even tell them they can choose to tell their friends and teacher if they like, as this creates social support,” says Dr Martin. Spending time together as a family also offers some stability for your child, when other parts of their world might be feeling out of control – and can probably help you along the way, too.